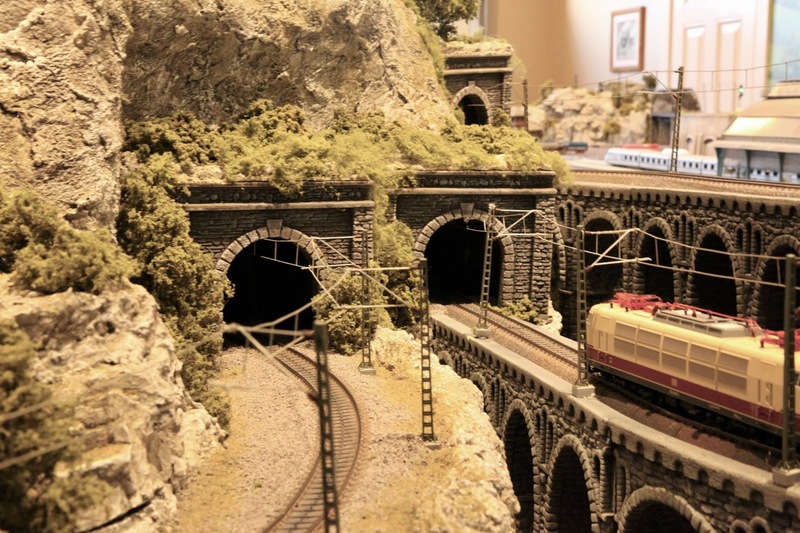 Euro Rail Hobbies and More Blog: Helix Mountain nearing completion. I've been working on scenery on the mountain for the last couple of days and thought I would update some photos. This pic shows the added base of the mountain with a planned water fall on the Lt, and a catch basin below, with an egress of small stream from Lt to Rt. The amount of snow on the mountain would dictate that the water fall actually be small rivulets gently cascading down the face of the mountain, and not an outright "water fall" of high volume. The Sculptomold was stained with "stone gray" and black leopard spotting technique with a charcoal mix as the last coat. I thought the end result was a bit too "bright" so the trusty air brush was summoned for acton to tone down the rock faces. Note that the base of the bench work was painted black. After the stains dried, white brush finish applied to bring out all the intricate rock detail of the Sculptomold. Another view. Hard to believe that a 2.5 turn helix lies beneath all this nylon mesh and plaster / Sculptomold. The small stream exits the layout on the lower rt. Now we need to add greenery. This is the ledge made initially of hot glued cardboard....finished well. The water fall rivulets will cascade onto these ledges. Stream bed below. 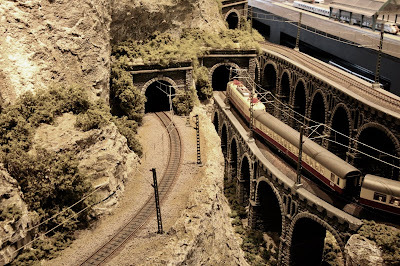 Train ascending helix to the main part of the layout. Greenery added. I also added "moss" type vegetation to the faces. 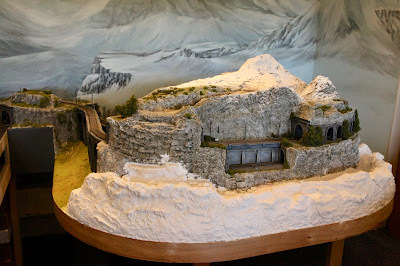 Technique: with a small paint brush apply dilute white glue or Mod Podge to a limited section of the mountain wall face, then "blow" a fine mist of WS "blended turf". ...I changed my technique a little. It's easier to place a little of the turf material in a small spoon and gently blow it onto the prepared rock face. Seems to work well. It softens the starkness of the rock faces. Added greenery around tunnel entrances....color not ideal...caused by 2800k lighting. The Mountain / Water Falls Complete !